Emiliano Zapata – The father of agrarian revolution. 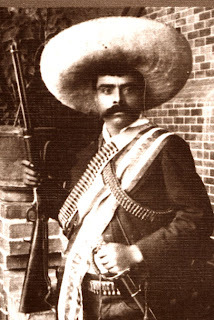 ‘The slight and swarthy man with the unappeased dreamer’s eyes’ Emiliano Zapata was an illiterate but in guerilla strategies there was none to excel him with a small rag-tag army he rose to power a to reckon with yet lived away from the comforts of power and lead a life dedicated to his cause. All the land grabbers, corrupt governments and its cruel army failed to defeat him. They had to resort to the path of deceit to dispose him off. Zapata remains role models to all revolutionaries and one of the rarest form of martyrs world has ever seen. 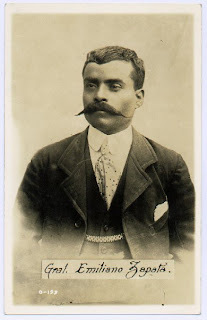 Emiliano Zapata was born in September 8, 1879 in a village by name Anenecuilco in Mexico. His family thrived on keeping livestock but did not own any land. At the age of 16 he was orphaned but survived by doing various trades. He was well known in the locality for his horse training skills and a rich planter hired him to manage his stables. One fact that struck Zapata was that these horses were accommodated in far better surroundings than majority of ordinary people of the locality lived. Those were times of extreme corruption on the part of government and utter helplessness on the part of the peasants; rich planters with the active connivance of government were in an expropriating spree and peasants were being driven out of their holdings day by day. Zapata joined the defense committee in his village, an array of protests and campaigns were to follow he was elected as the president of the village council, The officials lobby was all out to dispose him off sending him to the army was just a part of the conspiracy to keep him away so that they could keep their work uninterrupted. The absence of Zapata made the authorities bolder and they planned to make a hospital at Anenecuilco wanted to occupy the entire cornfield owned by the peasants and asked them to vacate. When Zapata came on leave the entire villagers were in a state of shock; and there was no one to lead them. Zapata was getting catapulted in to a world of guerilla leadership, however the first operation turned out to be a bloodless one, seeing the Zapatistas (as his army came to be known) the government guards fled; the land was again to the villagers. Peasants of the neighboring villagers also started to approach him with similar issues. 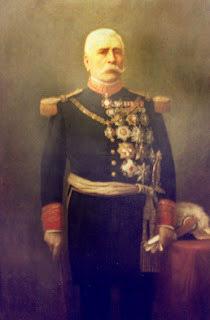 The dictatorship rule by Porfirio Diaz was ideal for the growth of a revolutionary movement as people had lost all hopes in government as a justice rendering machine. 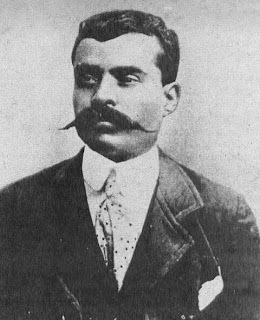 A call for joint-rebellion against the regime was received from none other than an exiled landlord Fransisco Madero, which was not acceptable to Zapata as a shrewd man he knew that they were not strong enough for an open war. He was engaged in liberating the looted lands and mediating disputes among peasants. He better chose to hide on the hills and when need arose came down as a whirlwind with well armed horsemen enacted instant justice and returned. He was like god to the poor peasants who had nobody else to look upon, some rebel leaders elected him as the ‘Chief of the revolutionary movement of the south’. Town after town fell before the Zapatistas, when the key town of Cuautla fell, president Diaz had to resign and leave the nation in disgrace. Old friend in new role. Whole of Mexico was in disarray landlords were a terrified lot, people were engaged in killing and looting each other as law and order became a thing of the past. 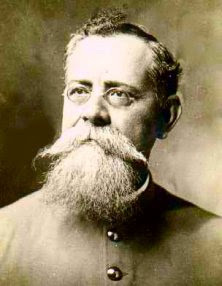 Madero who formerly asked Zapata’s participation in the rebellion came back to the nation and was later elected as the president. But President Madero who had a dialogue with Zepata was not his former self, he refused to heed to Zapata’s demands of immediate action, somehow an agreement was reached in a conciliation move Zapata disarmed his men and sent them to the fields. It was just a false dawn, Madero instead of honoring the agreement sent his army under Victoriano Huerta (the most cruel and ruthless commander of the army) to exterminate Zapata for once and all. Zapata had to withdraw to his old abode - the hills; and started to assemble his army again. There in the hills he proclaimed ‘Ayala’ (the land woods and water which have been usurped will be restored). General Huerta was doing whatever he could do torture the peasants, their fields and huts were burnt unarmed people were taken in to concentration camps, ultimately he turned against Madero –his god father himself. Madero was thrown out of power and later executed by Huerta. By this time Zapata was calling shots remaining in the hills most of the hinterlands fell before his army; in fact the actual power was with Zapata, he captured big plantations owned by planters and divided among peasants. In Mexico city as a winner. In November 26,1914 he entered in the Mexico City, he just lived there in a rented room and never resorted to throwing his weight around, he entrusted his political responsibility to his old ally Pancho Villa and returned to Morelos to take care of his villagers. There were coups taking place in the capital and all the governance fell in to utter disarray. This time it was Carranza on the helm who did all he can do to destroy a nation in five years but the limiting factor was the presence of Zapata who stood for the peasants. A plot that was hatched out by Carranza worked while at a ceremony Zapata was on his horse-back his back facing the army in a hacienda (large estates with residential colony) soldiers as planned fired at him he was dead before his body touched the ground. “Zapatismo is dead, Once the dog is dead, there are no more rabies” It was the exultation of Guajardo after dumping the body of Zapata in to the Cuaulta. He was mistaken the “rabies” spread after the death of the “dog” and finally took the life of none other than Carranza who was murdered while he was trying to escape out of the nation. One American observer comparing the situations in the Zapata ruled Morelos with other parts of Mexico reported that ‘true social revolution can be found among the Zapatistas’ hearing this Zapata remarked “Finally they (US) have done us justice, now I can die in peace”. Zapata was a rare breed among politicians and rarer still among revolutionaries. I'm not sure if you are biby cletus. Yet, I do thank you about popping in into my blog. Portugal is quite far away from India.. it's a fact, neverthless ideas can travel all over the world...and so does knowledge. I'll come back, take it for granted. Thanks for sharing this one ... with the world! The world needs a rare breed politicians at this time in history.